Sorry for the poorly exposed photo and my apologies to the woman at the right. I only managed to get off this one shot before getting yelled at by the shopkeeper. (Not sure why but a lot of stores seem to have a serious no photo policy. As an aside, I never understood this - how does it hurt sales if people are impressed with their store design and want to show their friends??) But look beyond the knick knacks and rainhat wearing lady over to the fireplace. Isn't that fabulous? I just love this idea. The detail adds such a great textural element while the color being the same as the wall creates a very modern look. And you already know I have a love affair with empty frames. Gotta.have.it!! The area over my master bedroom (non working) fireplace jumped to my mind. Looking through my archives, I don't think I have a recent photo of it so this one from during the reno will have to do. If I stand in another corner, the view looks more like this. Now the question is - where do I find a frame like this without having to take a second mortgage out? Frame stores are out of the question as the by the foot prices for this are sheer insanity. I've looked online without much luck but I'm not quite sure what this style of frame is called so that could be the problem. It can be any finish or even be a bit damaged b/c I'm just going to paint over it. Any suggestions for me? Any framers with a heart of gold out there? Beautiful store. Great idea. On occasion I will see a great frame at Hobby Lobby on clearance... or at an estate sale with a hideous picture in it. Usually you'll have to paint it! Can't wait to see if you find one! How about a cheap frame from goodwill or second hand and then apply modeling clay that hardens without having to bake it. Just add on layers and layers of sculpting. Hope you find one that's perfectly priced otherwise! Love the idea. You can try Craigslist. Sometimes people are so desperate to get rid of hideous artwork that they don't even notice the frame and you can get it fairly cheap. I'm no help at all, but I love the idea! 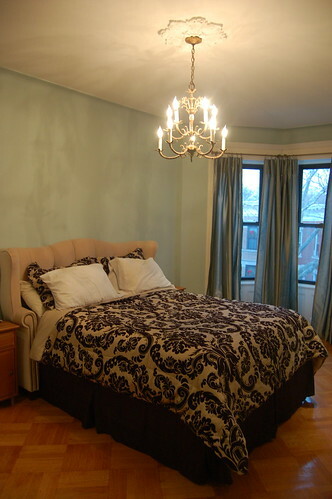 I also love the light blue color in your bedroom. I'm a huge fan of blue, and that color is just so serene! Sadly, I think this article my go some way to explaining why you may have been shouted at (http://thomashawk.com/2008/03/londons-metropolitan-police-launches.html). It has had a very negative effect on photography in London. I think the frame idea is great. I've never understood the no-photos policy, either. I got stopped in a furniture store once for taking a picture of a chair I was considering buying. I love London! Can't wait to see all your photos from your trip. Thanks Emmy. I can appreciate the anti-terrorism efforts but this is definitely not the case inside small boutiques. Its some weird store owners policy about photographing their merchandise. perhaps you can find an antique mirror online that is big enough for the space (i.e. this one from craigslist which is clearly too small). Just remove the mirror from the frame and voila! You should keep your eye out on craiglist , flea markets , it may take some time to find it though . I too don't get it about taking photos , I have recently had some words with Lowe's over this exact issue , I think it is rude to scold a customer or put them on the spot like that , doesn't leave a good impression , I haven't been back to Lowe's since, left a bad taste for me. Good luck with the hunt , and that will look so gorgeous. I think you might call that style of frame baroque. 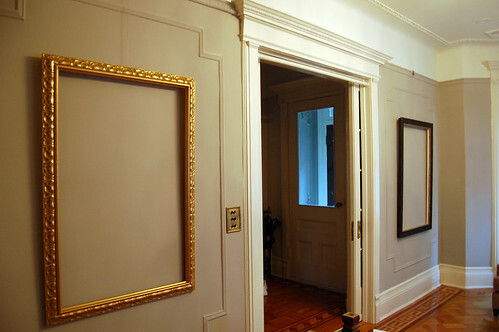 I bet you can recreate this by using simple crown moulding to create the frame and adding wood onlays like these? The reason the shop-keepers do not want photos is from the likes of the throngs of designers who shop and "knock-off" ideas. As a designer - it was an art to be discreet. I loved those trips but hated bits about it. I would rather be original than copy. I know you will find a frame or a molding to make you your very own clever creation. That frame is extremely ornate and beautiful. How about buying some crown molding and some wood appliques and building your own frame? I love this too! I just mirrored the space above our mantle and plan on layering large empty frames on top of it. I'm just keeping my eye out at thrift stores and antique shops. MrsFoot - That is perfect!! Im not sure if the size is right but Im going to measure and find out. And the store that sells is it located in Brooklyn! Its fate! That is beautiful! I can't wait to see if and when you tackle this project! And seriously Mrs. Limestone, you should stop being a terrorist...it's so last season. i love it! i can't believe the shopkeeper yelled at you! like you're really gonna copy her? and who cares if you did? you live in AMERICA. oh well. glad you got the one great shot! can't wait to see you remake it in your bedroom. As a shop manager for many years, we had some truly gorgeous displays done by some real talent! I always allowed photos and took it all as a huge compliment to those that put them together. I think there is room for all of the talent. It's so much easier to look at this as a positive. A chunky molding would be perfect and a fraction of the cost! oh my gosh that is stunning! i love how ornate it is - and that exactly what i think you should do a search for to find one. i've been keeping my eye open for something like this too but haven't been too diligent with it. perhaps it's time for me to start searching again! Your bedroom looks gorgeous, btw. I love the color, the fireplace, whatever the heck is on the fireplace (can't tell if that's tile). Oh fudge, why don't we just sign me up for being a tenant. Beautiful frame! It would look smashing above your fireplace and ITA with the goodwill stores! Etsy may have some as well! Great idea! With spring here I bet you could find a great option at estate sales or one of the larger flea markets! Would you share the name of the paint in your room? It is perfectly serene! Love it! I was recently at an antique show here in Texas that happens twice a year. I was on my way to a vendor but stopped to answer a question. A few minutes later I made it to the vendor I spotted only to see a woman walking out with a frame like the one you show in your photo. It was huge! And I told her I love that where did you get it and she said here just 2mins ago and for only $45! I was so sick! If I hadn't stopped I could have beat her to it! Oh well, I hope you find one! I will keep my eyes peeled for you here in Texas. hugs from Conroe, TX! This is my first comment. I have enjoyed your blog and find you an inspiration. Hope I am not braking any rules but while leaving in California I would get many treasures from a very talented lady. I live in Virginia now but she does have a online store. Look up White Rose Decor. She usually has mirrors.